Exclusive limited CD single, only available from here. A hand numbered edition of 100 copies only. Samson & Delilah are a 5 piece folk-rock band from Manchester led by the songwriting partnership of husband and wife Sam Lench and Anna Zweck. Their self-titled debut album of 2009 was well received by press, getting airplay on Tom Robinson (6 Music), sessions with BBC Manchester and BBC Nottingham, and led to shows at Greenbelt and Limetree Festivals and supports to Horse Feathers, A Hawk & A Hacksaw, 3 Daft Monkeys and Mick Turner (Dirty 3). 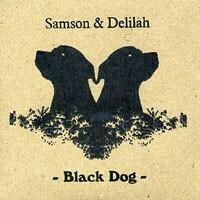 "Black Dog" is the first single from Samson & Delilah's new album "And Straight On Till Morning", scheduled for release in January 2011. Immaculately recorded live in a Victorian concert hall, the album shows the band's progression from a duo vehicle for Zweck and Lench to a full band capable of shifting in a heartbeat from mournful piano laments to Byrds-like psyche-drone to recalling 'Arcade Fire after a country-folk makeover' (City Life). The single "Black Dog" is a perfect introduction to a stunning record.